I think we are probably getting the message that we are eating too much sugar, too much salt and not enough fibre. It’s one thing knowing this and quite another actually doing something about it. Of course the very best way to put this right is to cook everything from scratch using good quality raw ingredients. Even if we are trying to do this, it is not always practical or convenient to cook absolutely everything from scratch for example even I wouldn’t make my own oatcakes, not all the time anyhow! There are also some perfectly healthy options out there on the supermarket shelves but how do we really know which they are? 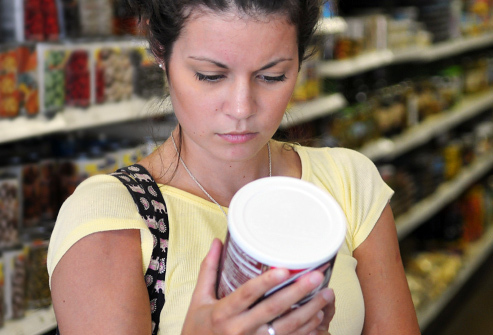 First and foremost we need to learn how to read food labels and understand what they mean in terms of health. I would be wary of any claims such as, ‘low in sugar,’ or, ‘90% Fat free,’ without looking at the nutritional information on the food label to see what truth there is in the claim. To begin with you need to have an understanding as to what is a little and what is a lot of sugar, fat, saturated fat, fibre, salt and sodium. Generally speaking the saturated fat content is more important to consider than the total fat. Essential fats like those found in nuts, seeds and oily fish are very good for your health. Although butter is very high in saturated fat it is by far a healthier option than margarine. Foods which claim to be low in fat may be very high is sugar! ‘Reduced fat,’ doesn’t necessarily mean low in fat, look at the label. ‘Lite,’ what does that really mean? Look at the label. This article from the Daily Mail about misleading claims relating to fat might interest you.